All photos by Navid Baraty. This article appears in print in the September 2018 issue, and is presented by Impact Washington. Click here for a free subscription. Cofounded in 1910 by Swedish immigrant Albert Wekell and his brother-in-law, T.O. Johnsen, Tacoma-based North Star Glove Company continues today under third-generation owners Rob and Tom Wekell. While cheaper work gloves from overseas manufacturers may seem initially attractive, Rob Wekell says North Star’s motto — “The bitterness of poor quality remains long after the sweetness of low price is forgotten” — has sustained the business through the Depression and two world wars. North Star employs about 50 workers, but Wekell says it can accommodate twice that number. 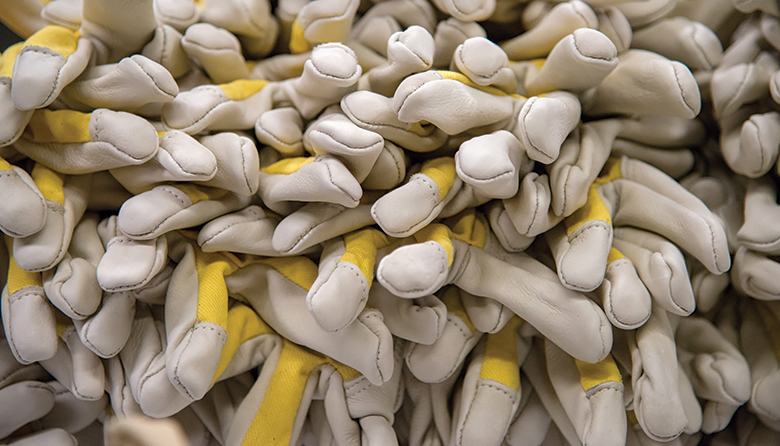 In the top photo, leather-palm drivers’ work gloves await forming and finishing. Above, a die-cutting machine trims 40 layers of material at a time, thread spools feed a quilting machine, and a canvas glove sits on a form after being turned right side out. Scroll through bonus photos from the shoot at North Star Glove Company below. See more Made in Washington photo galleries here.